Our late chicken rice lunch at Thien Kee Steamboat Restaurant 黃金瑞記煖爐, at Golden Mile Tower, #B1-20, 6001 Beach Road. 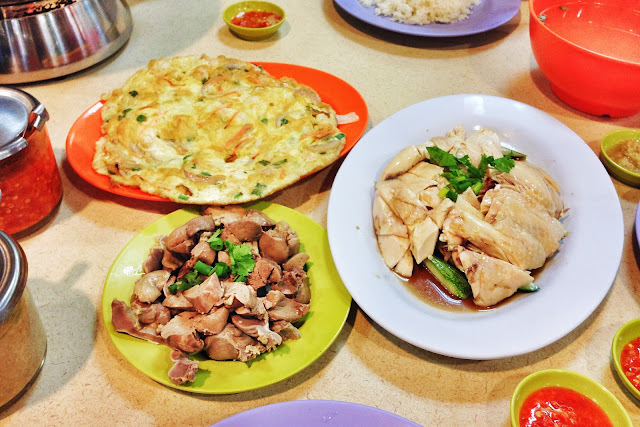 Hainanese Chicken @ $10. The waitress asked whether we wanted a half chicken ($16) or a $10 platter. Thinking that we should add on other side dishes, we opted for the platter. Nice but i miss the chicken rice stall opposite Golden Miles Tower. Oops. Fu Rong Egg Omelette @ $10. We ordered this without asking the price. Usually it costs around $6-$8. Hence we are a little shocked at the price. Nice, but there's nothing in the omelette that is worth the amount. Chicken kidney & liver @ $3. I don't really like eating chicken liver. The soft texture is not really my preference. The total bill came up to $27.90, includes 3 chicken rice and 2 drinks. We returned the wet tissues. Hee.. Save some money. One little hiccup. A strand of my hair landed on my rice and the waitress was serving the drinks. She highlighted to me that I have hair on my rice. And she won't put down the drinks until I acknowledge the hair and not complain to them about it. Haha but it is obviously my hair, why would I complain about it? Maybe they kenna before? Weird.